Emilie Bigottini , a famous ballerina, is depicted here assuming the role of Bacchante with grapes in her hair and a leopard skin over her shoulders. Bacchantes were the female companions of Bacchus, the Roman god of wine and ecstasy. They abandoned themselves to drink and licentiousness at the Bacchanalian festivals. 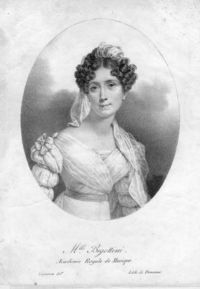 Emilie Bigottini joined the Paris Opera in 1801.